I really haven't posted much this week. I guess I'm waiting for the inspiration. You know, the funny story or the witty topic . 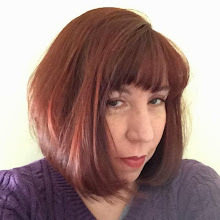 . . the great post that will entertain my friends in blogland. I love you guys, I don't want to bore you if I have nothing blog-worthy to write about. Well, inspiration hasn't come to the (mostly) self-taught knitter. It's just been normal life. Cooking, cleaning, yadda yadda yadda. But I have been knitting . 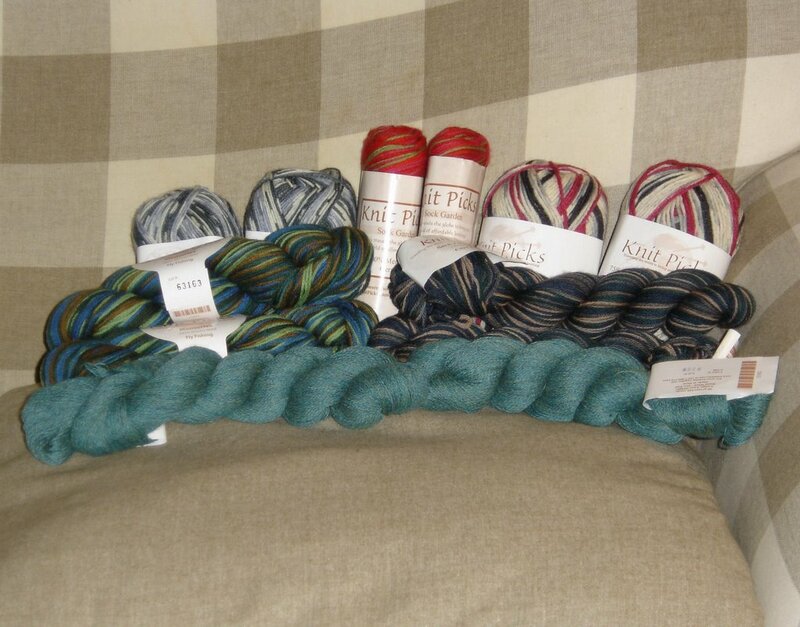 . . and oh, I've acquired some yarn. That's always exciting!! 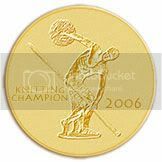 This being a knitting blog, I would say knitting and all things fibery must qualify for blog-worthiness!! Lets not forget, Tuesday was Valentine's Day!! I asked Sweetpea numerous times what he'd like . . . and he kept saying Valentine's Day is for girls and I shouldn't get him anything. I agreed . . . but come on, I wouldn't do that!!!! 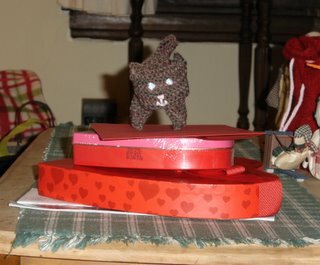 So along with a couple of boxes of chocolate, I knit up a little kitty for him!! Hard to believe, but he loves this stuff - he asked me a couple weeks ago when I would knit him a cat or elephant. So he was thrilled with this little guy. Now I'm no fool. (Okay, I am, but not when it comes to gifts from Pea. One year he gave me Round-Up Weed Killer as a birthday present. I learned my lesson that year!!) So I e-mailed him a couple of wish lists that I had compiled. 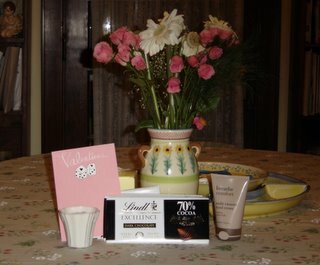 On Valentine's Day he gave me some gifts he had picked out on his own. I'd say he did quite well straying from the list!!! He's a sweetie. He takes a night class on Tuesday nights, so I couldn't cook him a romantic Valentine's Day dinner, but we met for lunch. The best present of all is being with him, so I was feeling a bit sad when he had to go back to work. What better way to cheer myself up than a mini-yarn crawl!! I treated myself to some yarn I'd been craving . . . but I'll save that picture for Flash Your Stash Monday. Sorry, I know that's a tease, but I will say I bought something that begins with a K!!! Of course, had I know he also put the wish lists to good use, I would have held off on the yarn buying. Today these arrived. I can't believe he ordered ALL of them!!! He's a prince. Since I've already revealed how spoiled I really am . . . I received another incredible gift in the mail today!! Plymouth Sockotta yarn from Jessica!! I so did not deserve this. She only TiVOed half of the Grey's Anatomy that was on after the Superbowl, and promised yarn to anyone who would send her a tape of the whole episode. I had just read over at Purls of Hope about a web-site where you could go watch the whole episode. So I let Jess know about it . . . but since I didn't send her a tape I didn't expect any yarn. She was kind enough to send me some anyway. Isn't she a sweetheart??? The colors are so pretty, it reminds me of spring flowers. (You can't really tell in the picture, but it's got great lavendar, pink, green and blue!!) Just what we need in gloomy mid-February. So I didn't find anything witty or a great funny story to tell you. But I am surrounded by wonderful generosity and feel truly blessed in my life. What could be more blog-worthy than that? Pea did a great job for Valentine's day. My husband still fears yarn purchasing so he goes with the traditional gift certificate. I love the weed killer as a gift. I got a shop vac one year. My husband always says Valentines Day is for girls too. That is so neat that he likes the kitty you made him. No witty comment or anything from me today. Just stoopping by to say hi and give you a big ole MWAH!